Velux Skylights are not new to the world of illumination. Their beginnings could best be described as ‘humble’, and began when a Danish entrepreneur, Villum Kann Rasmussen, installed his first roof window on a school near his hometown. From these beginnings, a devotion to craft and workmanship has resulted in their spread around the globe. Velux Skylights are now found from Melbourne to Minsk, in nearly every country in the world. 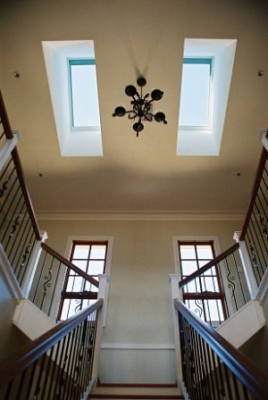 Oft imitated, although never truly duplicated, these skylights feature some key characteristics, which have set them apart from their peers over the course of the years. First, their glass is a thick, toughened, and scratch-resistant polymer, one that is built to resist not only the elements, but falling branches, and extremes of heat and cold. The mechanisms behind the mechanical and electrical lifting follow this same regard for longevity. Secondly, the Danish winter lasts a long time. Constantly swept by storms from the North Sea, Rasmussen’s first skylight was obliged to cope with the weather head-on, so its seal and installation had to be extremely tight, and properly done. He also was forced to contend with the extremes of cold in this Scandinavian winter, which could contract and expand the seals on the skylight. Consequently, this first installation, and each one since then, had to be done with considerable care. Luckily, as a master craftsman, he was able to accomplish his task and provide a well-constructed skylight that provided healthy and natural lighting for this school for many years. Velux Skylights carry on this legacy of commitment to craft and devotion to quality, in Melbourne, and around the world. For more information, check out our showroom!